My cat, Bella, has been driving me crazy. She’s decided that “I’m not gonna eat that!” is her new favorite game in the world. As food goes, Madame won’t have the chicken — that would be the super-premium raw frozen organic chicken, which she has eaten with gusto for months. Madame also won’t have the duck, because it’s too rich and makes her throw up. Instead, Madame would prefer the rabbit (which, naturally, costs about $8 more a bag than chicken or duck), or, if you please, some low-carb, grain-free pate. Ugh. Is your cat not eating? I know I’m not the only cat parent who has experienced a cat not eating, so here are some things to try when your cat won’t eat. Is your cat not eating? She might be sick or in pain. Photography by Eugene03/Thinkstock. 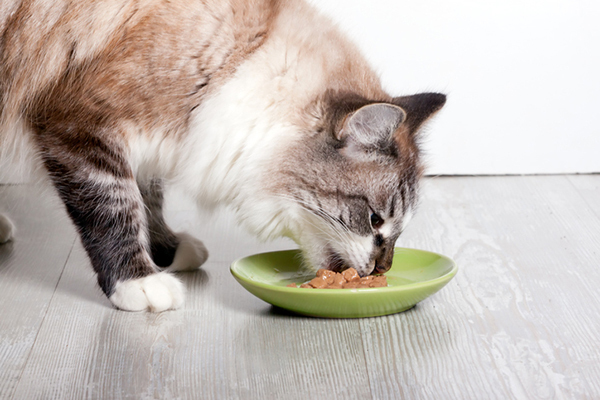 A cat not eating can be a sign that your cat is sick or pain, particularly if it continues for more than one meal. If this is the case, bring your cat to the vet. If you have an ethical or medical reason you need to stay with a certain brand of food, see whether it comes in other flavors. Think about trying other brands that might provide the same medical or health benefit. Your cat might find the change refreshing. If you’ve kept your cat’s food in the refrigerator, five to 10 seconds in the microwave will heat it up to about body temperature, and the smell will become attractive to your cat. If you don’t have a microwave, try mixing some warm water into the food instead. Cat won’t eat? Try adding a tempting treat to her food bowl. Photography ©RooIvan | Thinkstock. Try sprinkling your finicky cat’s food with a tempting treat like bonito flakes or cat vitamin powder. This is especially important if your cat eats canned or raw food because germs can start growing in scraps of leftover food and cause illness. A cat not eating might hate the smell of her dishes or food. Cats are instinctively driven to avoid consuming putrid-smelling meat. If you use plastic dishes, replace them with metal or ceramic because they’re easier to keep clean. A cat not eating might simply dislike his bowl. Some cats don’t like deep or narrow dishes because they constrict the whiskers. Flat-faced or brachycephalic cats such as Persians, Himalayans and Exotic Shorthairs should not be eating from plates or shallow bowls anyway. Once upon a time, I ground a pill up and put it in my cat’s food. What I didn’t know was that the medicine was really bitter. My cat refused to touch it, and she never ate that particular brand and flavor of food again. 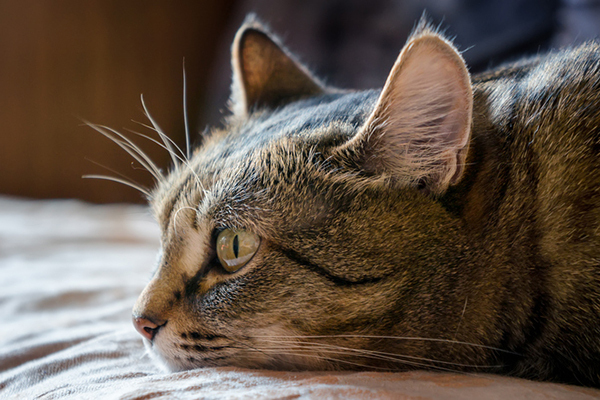 Some medications come in flavors that appeal to cats, but they’re few and far between. Ask your vet before trying the powdered-pill-in-food trick. 8. Remember — choose your battles! Is it really that important to you that your cat eats just one flavor of just one brand? Even if you love pizza, you’d get sick of it if you had to eat it every day for the rest of your life. This is the approach I’ve taken with Bella, and frankly, it’s what I should have done from the start. Cats need and deserve some variety in their diet, just like us. 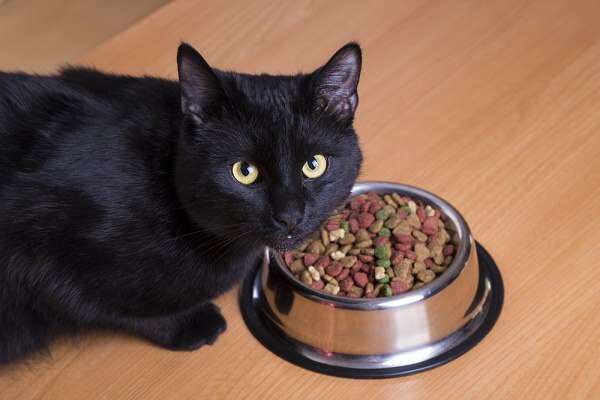 Tell us: Is your cat not eating? What did you do when your cat wouldn’t eat? Please share your stories and tips for a cat who won’t eat in the comments! Thumbnail: Photography by aleg baranau / Shutterstock. hey i am sid from India Hyderabad city.my kitten 7 month old Persian name oreo.once I tried wet food afterwards she totaly refused dry food.i had to mix alwayd wet with dry.i tried my best and am giving her wet food brand like applaws,bellota,royal canin,and in dry tried to give orijin but same as refused always dry one. how she may come back on dry food like one time dry one-time wet food how.she is super stubborn and every time i gave up and had to give again wet food only. My cat hasn’t been eating for about a week. She is closing in o 13 years old. She has done this twice in the past, and both times I took her to the vet. In the end they couldn’t figure out what was causing this, both times they gave her something to stimulate her to want to eat, and both times I left the office $700.00 poorer. I had more money back then and could afford the cost. I don’t know what to do. I think I will call my vet, explain my situation, and see if she can just give her the appetite stimulant rather than doing a bunch of tests first. I tried that with my vet and was told “no!” Tests needed to be redone, imaging, and they wouldn’t even tell me if they would give me another Rx for lactated ringers. Basically, if I can’t afford the clinic, they don’t want me as a patron. Oh, they keep bringing up euthanasia as an option. My 8 yo cat was fine. Eating, drinking, playing up to about noon 24 hrs ago. Then stopped eating . She sits crouched down and has been swallowing a lot. She did drink water today. Threw up once yesterday. My cat is refusing food and we’ve taken her to the vet a few times already. They did a full check-up and blood tests and say that she is physically healthy, yet she’s still not eating. They did give a nausea shot and appetite stimulant which is only making her drowsy. Could she be avoiding food because she’s stressed from all the vet visits? My cat has the exact same behavior and received a nausea shot at the vet. I’m supposed to give her Sulcrate suspension 1-2 hours before meals, by siringe, but it’s impossible. He would fight and spit it. Meanwhile, he won’t eat anything, licked a bit of pate from the vet on my finger, but had really no food for 72 hours. Please tell me my cat is not eating anything only drinks water and has bleeding bums pease tell my what to do because there is no vet nearby in my town! Get your cat to a vet asap!!! My cat has been to the vets multiple times. He’s eating very little at this moment. We had just upped his thyroid meds. And will be rechecking the labs again later this month to see how it works out and to see if the kidneys aren’t affected. However, since that visit he started sniffling and runny nose and wont eat much. Took him to the vets again they gave me antibiotics to help fight the ‘cold’ off. Told me to use saline spray to help clear his airways. He’s still not eating much (not enough to keep weight up). Is there any other advice to help a sick cat to start eating again? Hi my cat recently started being picky, and will only eat when I sit on the floor with her and even then sometimes won’t eat . I changed food gradually. I have always added some soft , so I switched that also. This has been over the last month . help ???? Hi , my cat don’t have an appetite since 3 days till now. I don’t know what to do. He got so much loss his weight . We tried already to give him other kind of food but still the same . Please contact your vet ASAP if your cat isn’t eating. I took my cat to the vet for the third time this week, and still no answers. My baby is not eating anything for 4 long days :-( I don’t know what to do anymore. Fancy Feast makes a high quality broth for $1.17 a pouch at Walmart in many flavors. Get a few for your cat just to see if it likes it. Chances are it will and when you decide to find out if it’s syffering from kidney failure, you can hide the medicine (with some water) in the already made broths. Cats don’t have much appetite in the beginning of the disease but cats will prefer broth to water so it will begin to gain weight even tho it’s not hungry. We have always fed our cats with dry food throughout the day, which they just ‘pick’ on, and a can of wet food for dinner. They also LOVE their treats. My 2 year old cat recently gave up on the wet food, as he just sniffs it and walks away. As of the last few days, he has now quit eating his treats! They are the same treats that he has begged for in the past. Possible teeth problem?? He hasn’t been acting abnormal, just his eating habits have changed. Looking for advice or wondering if maybe hes just going thru a ‘phase’. Thanks. If your cat isn’t eating, we suggest contacting your vet ASAP. These articles might provide some insight, but please reach out to your vet for the best advice. Sorry to hear you and your kitties are experiencing this. We suggest taking your kitties to a vet. Not everyone has money to go the the vet. My tuxedo cat hasnt showed interest in eating lately. She’s already picky with her wet food, like she wont eat shredded but will eat filets. She’s been real lazy also. Tried even giving her some milk, but lapped a little bit. What can i do to get her to eat. Please get this cat to the vet ASAP. It seems like something serious is at play! Definitely needs the vet. When a cat pees around the house either you’ve just added another pet in the house or the cat is sick. Our (fixed) female has gone on a hunger strike after introducing a new kitty to the family. She ate fine for the first few days after his arrival, but has been refusing for the past 36 hours. She does not appear to be in any pain or discomfort and is performing her usual activities, including using the litter box. Any suggestions? a bit of dry food in the night…but never resists when it comes to treats. He is about 3 yrs old now and been like this for about a year. He’s getting thinner and thinner but still active in playing and running around the house. Hi there, do you have any idea in how can I make my cat eat his food with digestive enzymes in his food? I have been tried many different ways, he used to eat normally but from one week his not interested. He is diabetic and he needs the digestive enzymes as well. He is well related to diabetic but the thing is: he found out that we have been added powder in his food. Thanks a lot. If these suggestions don’t work, we suggest reaching out to your vet. Hope your kitty feels better!